The main Window in Premember is where you can create tasks and access the other parts of the program. 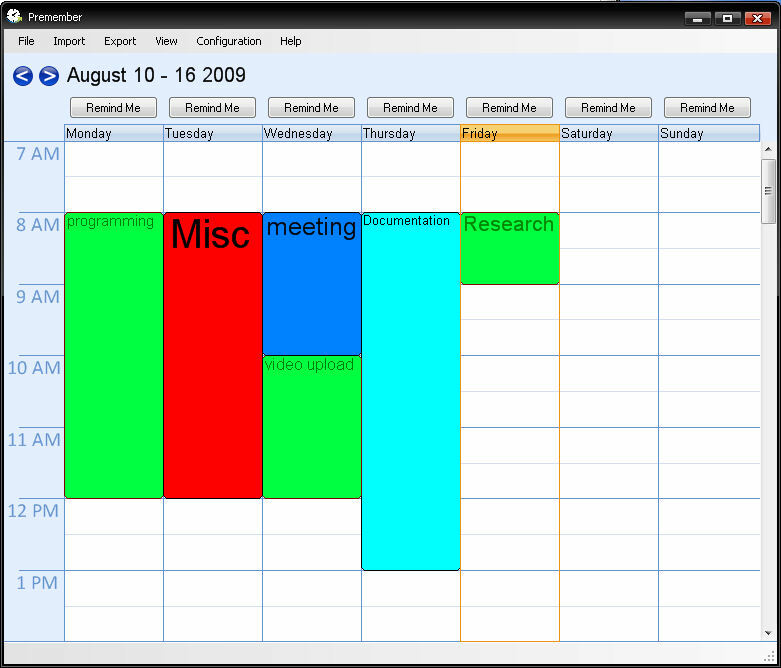 The Window Consist of a Menu bar and a Week Calendar. When you minimize the window a icon will appear in the tray bar so you can easy add a task. At the top the main window there is a menu bar where you can access different functionality. Here the different views are accessible. Here is the Configuration of the whole program located. This is separated in the configuration for the plugins and the configuration for the rest of the program. Here are links to the different help files located and general information about the program such as the version number. 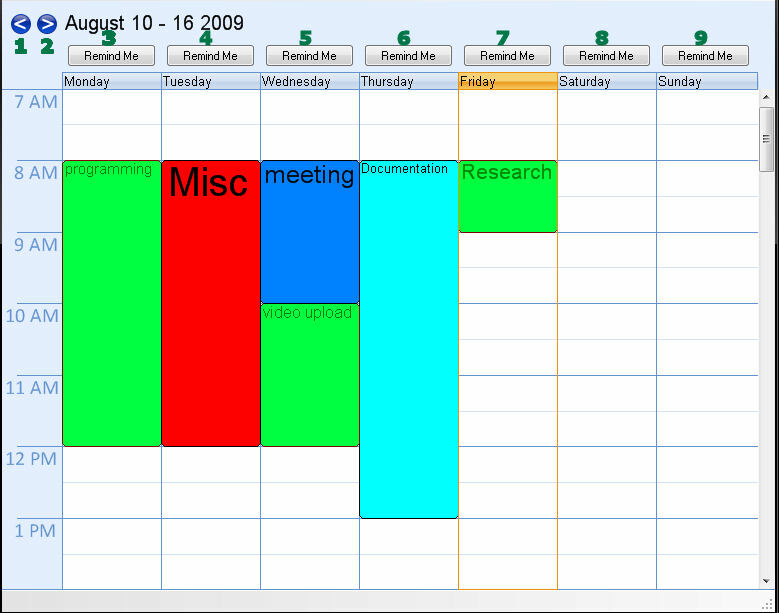 In the Main window there is a Calendar where you can add, move, change and delete tasks. The horizontal bar shows the hours and the vertical bar the days of the week. From the buttons with the Caption “Remind Me” you can access the part where you can look back into time. To start working with tasks you must first have atleast 1 Project and Task Category, these can be configured in the Main Configuration in the Project tab. When you minimize the main window there will appear a icon in the traybar. Double clicking on it with the left mouse button will bring back the main window. Clicking on it with the right mouse button will bring up a menu where you can create tasks by start/stopping a task category. Since the minimum interval is 15 minutes, there has to be at least 15 minutes between the start and the stop of a task category before a task is created. The visible taskcategories can be configured in the configuration under the general tab.